Welcome guest to Ayre Banners, a banner request site by me, Music. Here, I offer high quality banners requests for all your neo-related needs! If you have any questions, concerns or anything else, feel free to send me a neomail and I will get back to you as soon as possible. Hi everyone, oh wow it has been over a month again, since I lasted updated. Well I think that means something... It's true i am not planning on coming back to make graphics or even make another site again in the near future as real life just seems to get more busier each day, and I am caught up in homework to find time to come on and make banners. As much as I did enjoy making banners for other people, i have lost interest in it. I would like to thank everyone who has supported my site, especially my affies and listers for getting my site known in the site-making world of Neo. It was great fun while it lasted, but sadly it is time for me to leave Ayre Banners. Hey guys, wow its been over a month since i last updated. I know I said I was going to return and begin making banners again, but for some reason I have lost the inspiration to make them. I had planned on getting this site back on track but ever since i went on hiatus, i haven't come on Neo much. I am thinking of quitting the whole site-making world for good and just come on Neo for my guild but i'm not so sure yet cause i really don't want to close Ayre Banners. So affies and listers please don't remove me yet, i will let you know if i plan on not coming back or if i decide to stay. I still come on Neo when i can, so feel free to neomail me if you have any questions and etc. Thank you! Guess what I am back, but I will be putting the site on a semi hiatus, as i will still come on but I have a camp and I am super busy with school coming to a end for the term. So I will begin making banners again at the end of September. So sorry for those wanting to request a banner. Anyway, while I was away the GSA, came to an end and Ayre Banners, nominated banner came in tie in 4th place with the now closed Eternity. So a huge thank you to the people that voted for my banner, it means a lot. Thanks again. Also i received gifts from two affies, for Affiliate Day. Thanks both Krazy and Nicole. Check out the sitely section, to see what they said/gave. As i have finally reached my review request, it is now time to put the site on a hiatus until early september. Feel free to neomail me still and i will get back to you when i return. Also please still vote for Ayre Banners at the GSA. Thanks guys. Now affies with Made With Love, a petpage request site. It is worthwhile you check this fabulous request site out. I finally received my review request fromThe Theatre and i received a 75/100, which is okay i guess, even though I had hoped to get better.But that means I know what I can improve on. I really wasn't expecting this at all...but a banner I made got nominated in the special category of "Best Banner" at the Golden Sandwich Awards. It would be an honour to win, so please vote for the Queens Vault Banner. Thanks. Posted site news at The Catalogue, a brand new site news submission site. You should definetly check it out as it is new and reminds me of one of my old sites. I thought I would also update the listers buttons and these directories are now closed: Phoenix Directory, Oh Directory and Android Directory. I was looking over my affies and these sites have been removed for being inactive for a while, changed sites or closed: Incipit, Unicoto, Kimono, Eternity, Rogue Graphics and Unusual Magic. I now have 15 affiliates and there are 5 open spots left. I also updated each site's button so that they all look great. The wonderful button request site and affiliate of Ayre Banners, Writhe, has closed, but Brian plans on coming back with a review site. Wow, its been four days since I last updated, but I have been busy with school. I am still waiting for my review request from The Theatre. Hopefully i receive it before I put the site on hiatus on the 10th of August, which is next week. Got listed at Deadly Graphics Directory. Hey guys, I have been very busy with school and real life to be able to get on. But I had some spare minutes, so i thought i would update to tell you all that I am still around. I am still waiting for my last review request and when I receive that, the site will be on hiatus until early September. I received my review request back from Understatement and I received 4 out of 5 stars and at the end I received a total score of 84/100, which I am happy with. Once i get my final review request, the site will be put on a hiatus. Added a new FAQ question and fixed up the link back rule. I finally received my review request from Colour Block. I received 4/5 stars and a "I'm proud of all your hard work." at the end, as Marina doesn't give a score but gives her overall thought on the site.I am really happy with that and hope to improve on the site now. As a heads up, i am letting you all know that the site will be inactive during the whole of August and early september because i will be busy with family and school. So that means the site will be put on a hiatus and requests will be closed during this period of time. However when i return, requests will re-open. I did say that i would open requests at the end of this week, but i won't be because i have school starting up, so i won't have the chance to complete requests because of this. 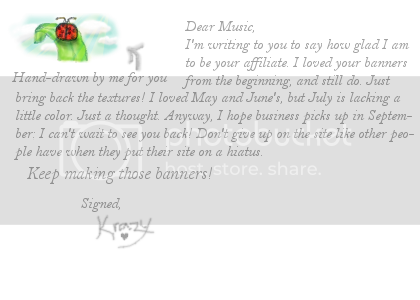 However i will still be coming on Neopets until the end of July and will be waiting for my reviews. Sorry for the inconvenience. Don't claim anything i make for you as your own, as i made it for you. Always put some sort of visible link credit in a credit/thanks section, if you remove the link back on the banner. I will only take requests for NR banners. If you don't like your request, let me know and I will be happy to re-do it for you, rather than you not using the banner. I will only take 2 requests per person every month. Make sure requests are open before you send in the form. To send me the form click the link and then copy and paste it into the neomail. Please make the subject "Banner Request". Drag to address bar to view full size image. 1. What program do you use to make your banners? I use Photoshop CS5 to create all my banners. 2. I really need a banner, but your requests are closed could you still make me one? Unfortunately I will have to say NO, as I closed requests for a reason and the most likely reason would be that I am busy with school and homework. 3. I don't know where i can find any NR images? Some great places that you can find NR images are here and here. 5. Can you teach me how to make a banner? As much as I would like to help you out, I don't have enough time and its hard to explain when there is so many steps. However you should check out these tutorials on making banners: Create Impresssions and Banner Buddies. Do you have a question that is not here? Then neomail me your question. Dreams of Neopia is a premade banner and request site and it is run by the friendly and kind Totem. So if you are ever in need of a high quality banner request or even a premade visit Dreams of Neopia because it sure will impress you! Hover over the site button to see ratings/score and comments. Hover over the site button to see comments and drag images to address bar to view full size. Content by (c) ipod_music_love 2011. Textures on layout are from swimchick and Nienke's Resources. Brush on layout from Foomanshu. Large Star bullets and Send me Neomail sign from The Lunch Box.